Address: Colonia Kennedy, loma de los generales, Constanza (Gran Santo Domingo), Dominican Republic. 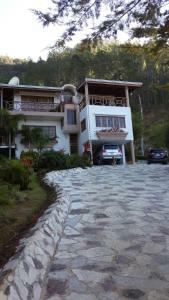 Offering a garden, Constanza Villa is set in Constanza, 24 km from Jarabacoa. Romana is 42 km away. Free private parking is available on site. The accommodation is fitted with a seating and dining area. Some units have a terrace and/or balcony. There is also a kitchen, fitted with an oven. There is a private bathroom with a shower in every unit. Towels are provided. Constanza Villa also includes a sun terrace. The property also offers grocery delivery. Bike hire and car hire are available at the property and the area is popular for skiing. You can engage in various activities, such as horse riding, cycling and fishing. The nearest airport is Cibao International Airport, 55 km from the property.